The question represented by the concept of the Goddess Mother Mary is closely related to the question of Eve. How are the two related? I was fascinated by your essay on Creation Myths and the Virgin Mary, and I have been wondering how all this relates to Eve. It is as the "seed" of Eve that Mary treads the Serpent (in the "mistranslation" of the Septuagint) and in mediaeval times it was common to speak of the "parabola" (up-down-up) pattern beginning with Eve in Paradise, descending with the Fall and returning to paradise with the redemption of the world by Mary. This Parabola was shown as U-shaped curve with the word EVA at the beginning and AVE at the end – signifying the beginning in paradise with EVA and the return to paradise with (AVE) Maria. What are your comments on this? The question of goddess Mother Mary is certainly bound up with the question of Eve, although this plays little role in the iconography or in the use of Marian images by many of us. The name Eve is a Westernisation of the Hebrew name Chavah which means "Mother of all living". Clearly this term has a double sense and could be interpreted either as "Creatrix" or as "Universal Ancestress". 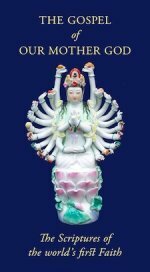 This, of course is in keeping with the doctrine of the Cycle of the Ages (see our page on Kali Yuga) which tells us that the earliest ages are progressively nearer to the Divine state and even allows traditional peoples to see the Golden Age as a microcosmic reflection of Paradise itself. While Eve is the Divine Ancestress, like the Japanese Sun Goddess Amaterasu, the name "Adam" means "earth" (and also red – red being the colour of Mars). Clearly this designation dates from a semi-matriarchal period, after the time when both Heaven and Earth were feminine but before the lesser element of earth was attributed to the feminine and the higher element of Heaven to the masculine. It dates from a time when the Divine Sun was feminine and the lesser element of earth attributed to the masculine. In the later patriarchal re-writing, Eve becomes simply the "first woman" and the Fall is blamed upon her (while actually it is simply part of the process of manifestation). From being the Creatrix and Conqueror of the Serpent (cf Creation Myths and the Virgin Mary) she is said to have been deceived by the serpent into disobedience to the masculine god. With the "deification" of the goddess Mother Mary, the true image of the Creatrix and Conqueror of the Serpent returns. Thus Mary was hailed in the middle ages as the New Eve and Queen of Heaven. Creation Myths and the Virgin Mary: What is a Creation Myth? Is it true? And How is Our Lady Mary connected with the primordial Creation Myth? 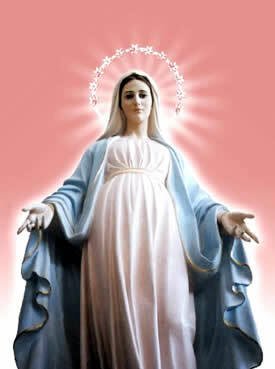 The Mother-God Hail Mary mp3 The Hail Mary "translated" for devotional use by children of Our Mother God. This Sermon, given at a Filianic Service, presents and explains the Mother-God Hail Mary. All written material on this site is copyright. Should you wish to reproduce any portion please contact us for permission.